Dryland areas in the west of China cover about 40 per cent of the country’s total land area and are very vulnerable to drought and desertification. A new report released today by the United Nations International Fund for Agricultural Development (IFAD) reveals that drylands, which cover some 40 per cent of the earth’s land surface, are critical in order to buffer the negative impacts of climate change, land degradation, and drought. “Drylands are absolutely key to global food security for the whole planet,” said IFAD President, Kanayo F. Nwanze in a press release on the report, which was launched today in Marrakech, Morocco, where the 22nd Conference of Parties to the UN Framework Convention on Climate Change (UNFCCC), known as COP 22, has been under way since Monday. “Environment friendly and water efficient agriculture for smallholders is key to reducing poverty, boosting smallholder adaptation to climate change, and rehabilitating degraded lands. We look to empower more rural farmers to sustainably manage their land, so that while they feed their families for generations to come, they can also get out of poverty,” he said. Drylands typically refer to arid, semi-arid, and dry sub-humid areas. They are present on every continent and are home to more than two billion people. They support up to 44 per cent of the world’s cultivated agricultural systems. The report, The Drylands Advantage: Protecting the environment, empowering people, explains how drylands support ecosystems and a wide variety of biodiversity as well as their vital role in the livelihoods and cultural identities of many people. In Swaziland, for example, IFAD has supported communities in rehabilitating gullied land and introducing sustainable land management practices for 68,000 hectares of land – thus generating a new source of livelihoods for the people who live there. In China’s Yanchi county, where drylands are becoming deserts, farmers have increased their incomes by 20 per cent thanks to a programme which generates alternative and sustainable livelihoods. Without it, desertification would likely worsen and drylands would be non-arable. “Desertification of drylands could lead to some 50 million people being displaced within the next 10 years,” she said. 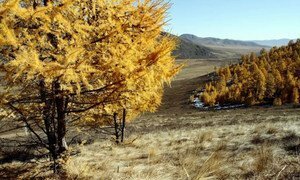 For the first time, a new United Nations report details the number of trees, forests and land use in the world’s drylands, and the findings could be used to track progress towards the Sustainable Development Goals and help fight climate change.